This accessible introductory text discusses how people in a pluralistic society such as ours can accept a common social ethic - a publicly justified morality. It presents analyses of the basic concepts, including justifications of liberty, harm to others, private property rights, distributive justice, environmental harms, help to others and offensive behaviour. Gaus acquaints the reader with the major figures in social philosophy - John Stuart Mill, Jeremy Bentham, Thomas Hobbes, John Locke, David Hume, John Rawls, David Gauthier, and Joel Feinberg - as well as recent communitarian philosophers. 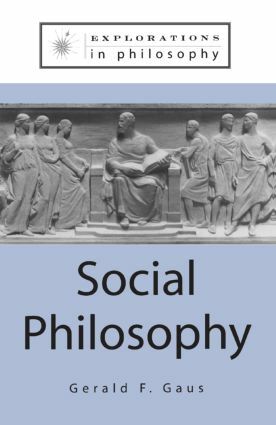 The basic technical aspects of social philosophy are also introduced: game theory, social choice theory, the ideas rational action, rational bargaining, and public goods. Throughout, helpful short examples and stories are used to illustrate the material. Part 1 The Idea of Public Morality: Moral Authoritarianism and Relativism - Morality as Liberty-Liberty Demands, The Suspicion That Morality is Authoritarian, Relativism - the Easy Way Out?, Public Morality and Cooperation, Summary; Public Justification - Public Justification as Non-Authoritarianism, Actual Assent Views of Public Justification, Justification Among Purely Rational People, Public Justification and Reasonableness, Consensus and Convergence Justifications, Summary; Value-Promoting Public Moralities - Teleological Ethics, Competing Values and Public Justification, The First Reply - Wide Consensus on Basic Goods, The Second Reply - Communitarianism, Summary; Utilitarianism as a Public Morality - Can Teleological Ethics be Rescued from the Problem of Reasonable Pluralism?, Jeremy Bentham and Utilitarianism, Want Satisfaction Utilitarianism, The Problems of Interpersonal Comparisons and Aggregating Preferences, Is Value Impersonal?, Non-Teleological Utilitarianism, Utilitarianism as a Public Philosophy, Summary; Strong Contractualism - Moral Contractualism, Simple Neo-Hobbesianiam, Gauthier's Reformation of Hobbesian Moral Contractualism, Is Strong Contractualism Really About Social Morality?, Summary; Weak-Contractualism - Justice as Fairness, Two Key Criticisms for Rawls' Contractual Theory, "Millian" Contractualism, Summary. Part 2 A Framework for Public Morality: Liberty - The Liberal Principle, Mill's Case for Liberty of Action, Autonomy, Summary; The Harm Principle - Harms and Interests, Psychological Harms, Is It Always a Harm to Set Back an Interest?, Risk of Harm, Harmful Acts and Omissions, Summary; Property - Property Rights and Harm, Lockean Theory and the Proviso, Meeting the Proviso - Compensation for Losses, Desert, Distributive Justice and Property, Summary; Public Harms and Common Goods - Public Bads, The Public Goods Principle, Common Goods, Summary; Two Quasi-Millian Principles - Mill's Libertarian Morality, Paternalism, Offense, Summary.